Daucus carota is a variable biennial plant. A biennial plant is a flowering plant that takes two years to complete its lifecycle. The first year the plant grows leaves, stems, and roots, then it enters a period of dormancy over the colder months. Usually the stem remains very short and the leaves are low to the ground. Many biennials require a period of cold treatment, before they will flower. During the next spring or summer, the stem of the biennial plant elongates greatly, or “bolts.” The plant then flowers, producing fruits and seeds, after which its life cycle is complete. 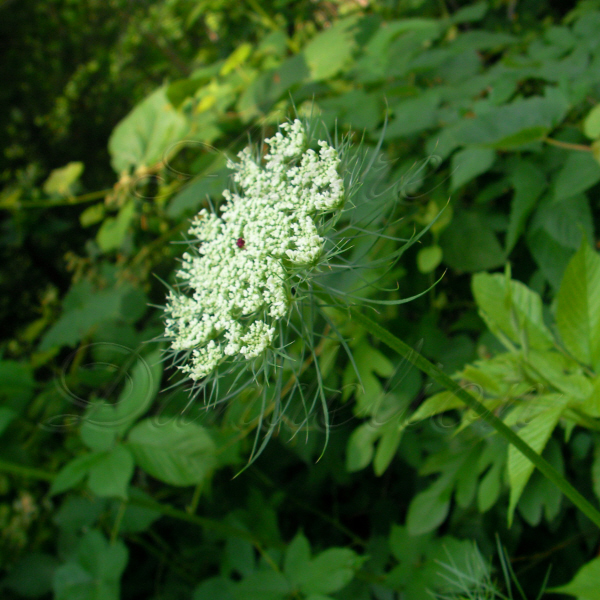 Common names include Wild Carrot, Bird’s Nest, Bishop’s Lace. In the US it is called Queen Anne’s Lace because the flower resembles lace, the red flower in the center represents a blood droplet where Queen Anne pricked herself with a needle when she was making the lace. It belongs to the plant family Apiaceae. Domesticated carrots are cultivars of a subspecies, Daucus carota subsp. sativus. 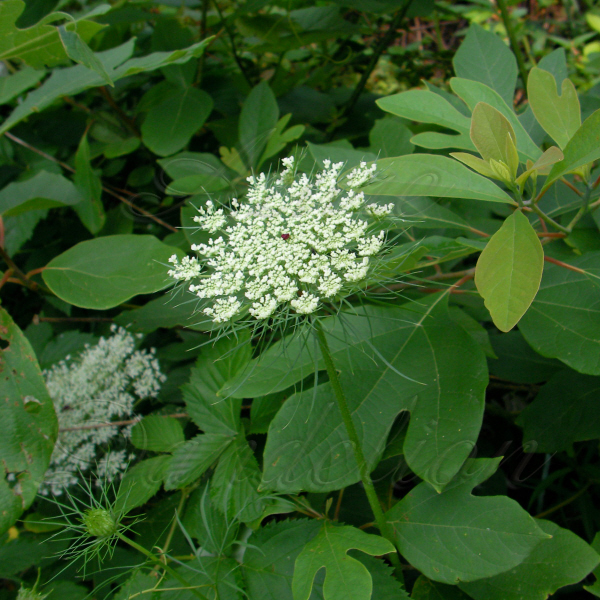 Like the cultivated carrot, the Queen Ann’s Lace root is edible while young, but quickly becomes too woody to consume. 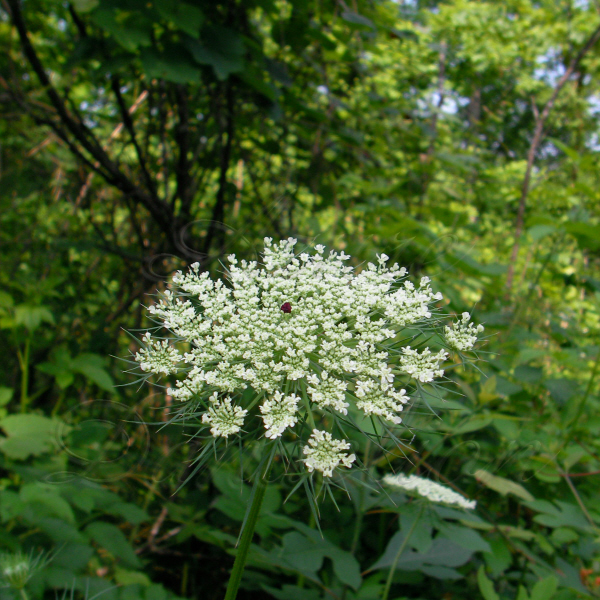 Use caution when using Queen Ann’s Lace as an edible or herbal treatment….as it is very similar in appearance to the deadly Poison Hemlock. Daucus carota is distinguished by a mix of bi-pinnate and tri-pinnate leaves, fine hairs on its stems and leaves, a root that smells like carrots, and occasionally a single dark red flower in its center. It usually flowers from June to August. Queen Anne’s Lace is native to many regions of Europe, southwest Asia and naturalised to northeast North America and Australia. Although the USDA has listed it as a noxious weed, and it is considered a serious pest in pastures….It can be useful to the organic gardener when used as a companion plant to crops. Like most umbellifers it attracts predatory wasps to its small flowers. Its species is also documented to boost tomato plant production when kept nearby. Much like Sunflowers, it can provide a microclimate of cooler, moister air for such veggies as lettuce and greens, when planted with it.